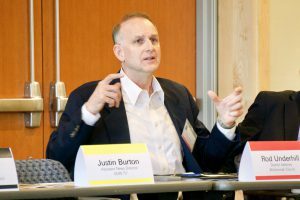 On April 6, 2019, Multnomah County District Attorney Rod Underhill, Deputy District Attorney Melissa Marerro and Communications Director Brent Weisberg participated in the 16th annual Building a Culture of Dialogue event hosted by the Oregon State Press Broadcasters Council. The Honorable Michael Simon of the United States District Court facilitated the event, which brought together approximately 50 individuals including representatives from the court, prosecutors, defense attorneys, law enforcement, journalists, and other organizations. 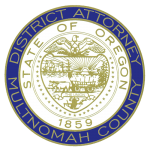 District Attorney Underhill has worked with the Oregon Bar Press Broadcasters Council for approximately 10 years. This year’s discussion included an in-depth conversation on issues about mental health and the rights of people involved in the criminal justice system. The Oregon Bar Press Broadcasters Council plays a critically important role at establishing relationships between members of the court, bar, and press so that lawyers, judges and members of the media are able to understand each other’s needs and concerns. The Council’s Bench-Bar-Press guidelines have adopted several policies and guidelines to ensure the public remains fully informed without violating the rights of any individual. Recently, the Oregon Bar Press Broadcasters Council updated the Uniform Trial Court Rule 3.180 to reflect changes in technology used to record and report court proceedings. The updated rule is detailed in the April 2019 issue of the Oregon State Bar Bulletin, which can be read by clicking here.